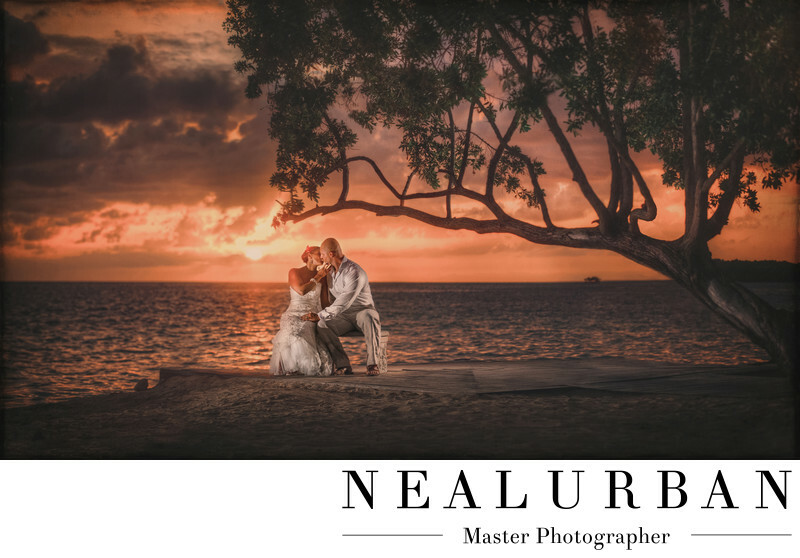 What could be better than a gorgeous sunset for a wedding photo! We definitely got that on on this destination wedding for Leanne and Rick! Their wedding was at Sandals White House Resort in Jamaica (now called Sandals South Coast). They had a beautiful ceremony right on the beach and cocktail hour followed directly after. They had a small tent set up on the beach with drinks an hors d'euvres. Everything was going amazing until it started to rain. It was coming down in buckets. No worries though. Everyone was having a great time. It only lasted a short time. Then the sky started to clear and there was a double rainbow. We had to sneak the newlyweds out for that. This image was actually taken the next day! We did a post bridal session with couple. When we travel to destination weddings, we always try to put together a package that includes more than just wedding coverage. We like to do at least one or two more shoots if possible. We ended up doing the day after with Rick and Leanne. Leanne had her new sister-in-law do her hair and makeup. Then they put a fresh Jamaican flower in her hair. Rick just wore his pants and shirt. We worked around the resort a little before sunset. We did photos along the beach and did some really fun shots. We were just finishing when we saw this little bench facing the ocean. We loved the tree! Not to mention the amazing sunset happening behind Rick and Leanne. Those dark clouds look pretty scary. The sky looked like it was on fire. It was breath taking! We have photographed two weddings in Jamaica so far. And we have had amazing sunsets every night we were there! Taking a bad photo was not an option! Location: White House, South Coast, Jamaica.